This is the first game in the Lost Planet series. For other games in the series see the Lost Planet category. 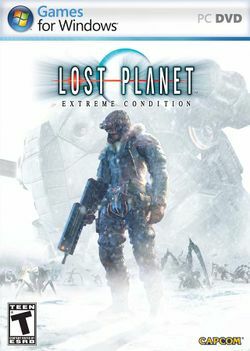 Lost Planet: Extreme Condition is a third-person shooter created by Capcom for the Xbox 360 and Windows. A PlayStation 3 version was released on February 26, 2008. The Collector's Edition of the game was released on January 12, 2007 worldwide. The Collector's Edition included a special edition tin cover, an art book including exclusive cover art, multimedia cut scenes, and multiplayer maps that would not be released until months later for free. Lost Planet: Colonies is a gold edition version of Extreme Condition for the Xbox 360 and Windows. The game includes new multiplayer maps, a Human vs Akrid multiplayer mode, and a selection of new multiplayer characters and weapons. Colonies also introduces four new single-player modes: Score Attack, Time Trial Battle Mode, first person shooter, and Unlimited Mode. The game also includes cross-platform play between Xbox Live and Games for Windows – Live users. The Colonies edition is not compatible with the original Lost Planet save games or multiplayer game, so players of each release may only play with others who have the same release. The game was released in North America on May 27, 2008; in Japan on May 29; and in Europe on June 6. Lost Planet takes place in a dystopian future (the year is given as T.C. -80) where planetary conditions on Earth have become too hostile to support human life. A scientific enterprise known as Neo-Venus Construction(NEVEC), spearheads a colonization effort, ultimately choosing the planet of E.D.N III. E.D.N. III is perpetually cold and snowy, originally inhabited by a species of aliens known as the Akrid, who forced humanity to abandon E.D.N. III by strength of numbers and surprise. Initially, the Akrid deterred humans from colonization, but this changed when T-ENG was discovered. Thermal Energy, or T-ENG, is a powerful energy source, found only in Akrid bodies, which made humankind determined to fight the Akrid, for which purpose NEVEC created the Vital Suit, or VS, technology, essentially mechs powered by T-ENG, carrying mounted weapons. This page was last edited on 10 July 2016, at 02:44.